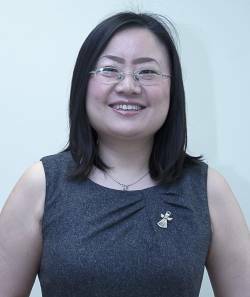 Ying Peng, a Podiatrist from the Edinburgh area, was the proud winner of the Cosyfeet Podiatry Award 2017. The £1000 award funded Ying’s pioneering work with dementia patients. Here she reports on the project. To raise awareness of the issues surrounding foot care for those with dementia, to help to keep them mobile, preventing falls and improving their quality of life. I initially researched work already done in this field but could find none. I then phoned the dementia UK support line and was given the answer that not many people or families seek advice about this, which made me a little concerned! Further when I introduced the project to people involved with dementia care, they often commented that feet are the last thing they think about in relation to the dementia patient. Having, healthy feet is essential for everyone to remain mobile and active (NHS choice 2018). Foot problems can affect patient mobility and cause pain, which can have a negative impact on someone, especially elderly people. Dementia patients have difficulty communicating; therefore, they are not able to express their problems. I strongly suspected that I would encounter other issues which I did. I have been involved in caring for patients living with dementia for the last 6 years and often witnessed their frustrations and the implications this has for family and medical professionals. It was observing this that initially motivated me to become a podiatrist, and subsequently to use my combined experience in dementia care and podiatry to conduct this project. Over a period of 5 weeks, I worked for many days on Willow Ward, which falls under the remit of NHS Lothian and Edinburgh Health and Social Care partnership. Willow is a 30-bed ward providing care for patients living with advanced dementia who require hospital-based complex clinical care (HBCCC), and patients who are waiting to be assessed for movement to a care home. I examined patients’ feet, diagnosed issues and carried out treatment where appropriate. I spoke with patients’ carers and nursing staff and provided them with answers to any questions that they had. I also volunteered at a local charity dementia group where visiting members enjoy singing songs, having lunch together and playing games. They are still able to have conversations and do things for themselves but sometimes need assistance or guidance. Here I also examined member’s feet, conversed with volunteers and family, and made them aware of issues affecting foot care for elderly and dementia patients. I demonstrated and explained about some simple ways to care for feet such as a daily check, use of emollient cream, or filing nails weekly. Volunteering on the ward and with the lunch club enabled me to work with patients at different stages of dementia and gave me a fantastic opportunity to understand the practical issues involved. Here is a summary of six of the patients I treated. I have documented the implications of dementia for foot issues for each individual. This female patient had been diagnosed with early onset dementia with paranoia and intermittent aggression. She also had acne rosacea and breast cancer. This lady is in her late 50s and is constantly walking around the ward and bumping herself. To keep her safe, nursing staff must be with her at all times throughout the day until she goes to bed. They noticed that she had persistent bruises under her toenails. Trying to understand how much time she is on her feet, I walked with her until she stopped, then with less than five minutes sitting in a chair she started to repeatedly walk around again. After an hour, I felt tired walking up and down the ward with her, however, she can walk for hours with limited rest. 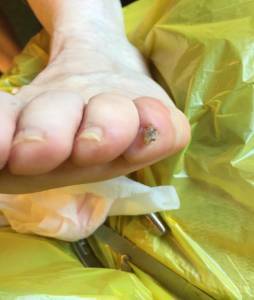 Examining her feet, I found that she had a subungual haematoma on both fifth toes and her left fourth toenail was partially avulsed, with a new nail already growing. Subungual haematoma is often associated with tight/small fitting footwear (Brown 2007). She was wearing shoes with insufficient space for the toes: slip-ons with a narrow toe box. Having proper shoes is necessary for this lady. Making family or people in a position of guardianship understand the importance of footwear can sometimes be difficult. However, I discussed this with the nursing staff, and with their efforts, talked to the family. This lady was then supplied with new trainers which will hopefully stop this from happening again. A gentleman with advanced dementia who has been catheterised for urinary retention. He has a regular urine infection with a highly resistant organism. This gentleman walks around the ward wearing only anti-slip-socks. Concerned about the potential risk of injury with him not wearing shoes, I was thinking about whether there was anything I could actually help with. I observed this patient’s festinating, shuffling gait which looks similar to someone diagnosed with Parkinson’s. The gentleman seldom stands straight; his knee is always bent, so it’s easy for him to pick up items from the floor himself. When he sees the door open, at times he suddenly tries to run the very short distance, to catch the open door and get out. He has callus built up on both heels and both feet are swollen. He had a history in his medical files of frequent falls. The shoes he used to wear are no longer suitable, either too narrow or slip on slippers which did not stay on his feet properly. He is now wearing only anti-slip socks and has stopped falling. This would seem to suggest that the falls were due to his improper footwear. Without fully understanding his gait and balance over time I was not prepared to recommend properly fitted shoes. Whilst this would of course reduce the risk of trauma it might put the patient at risk of injury due to potential future falls. To mitigate the risk of trauma without shoes the staff agreed to check the patient’s feet daily. Proximal Interphalangeal (PIP) joint ulcer on the medial side of the second toe. A lady who has advanced mixed dementia with type 2 diabetes. Her insulin was stopped due to the difficulty in monitoring her blood glucose level. She is emotionally unstable, unpredictable in moods combined with a short attention span. The nursing staff said she had an infection on her left foot, second toe. The doctor had already prescribed antibiotics. 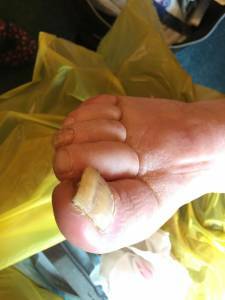 When I examined her foot, she had a proximal Interphalangeal (PIP) joint ulcer on the medial side of the second toe. She likes to place herself on the floor, either in the corridor, dining room or office. While she has slippers, she goes barefoot whilst walking around the ward. Normally, a podiatrist would use a scalpel to remove skin callus around the wound, to help with healing. However, this patient can suddenly become agitated, refuse any treatment, move away without warning and use aggressive language. Trying to catch the right moment, with help from the nursing staff, I managed to apply a dressing and carry out limited skin callus debridement. I monitored her for a couple of weeks. I always had a nurse with me so that she could talk to the patient. All that I was able to do was put a dressing on from time to time. This patient’s case made me ask myself some very difficult and unresolved questions. Could there be another safer way to treat a similar condition patient in the future? What other options could I use? This female patient has vascular Alzheimer’s with hypertension, hypothyroidism and hearing loss. In her medical notes, it states that her husband cannot cope. When someone first meets her, you would not recognize that she suffers from dementia. Her husband takes her out every day but when she comes back she walks around constantly trying to find her husband, showing suspicion about the surrounding environment and people she meets. She has complained about sore feet, but when I examined her, she said that she did not have any problem was unable to point out where the pain was. So, in order not to stress her, I invited her husband to join us. My main concern was her footwear which had a very thin insole without enough internal cushioning. I tried to ensure that any questions to the husband did not appear to be criticisms of him. I asked if he had any concerns about his own feet to help illustrate how important it was to consider the correct footwear for his wife. His right foot, first metatarsal phalangeal joint, had actually been sore for a long time. As he needed to look after his wife, he had never bothered to check out his own problems. I undertook a joint assessment which indicated he had a Hallux Limitus. I observed his walking boots, worn for many years, had a hole on the side, he had not noticed this. He expressed guilt to me that he could not look after his wife at home and I gave my suggestion of what kind of shoes would be ideal. Later that week, they each got a pair of suitable trainers. The gentleman promised to make a follow up appointment with a podiatrist. I wanted to mention this case study to show the pressure a family member of a dementia patient can experience, often resulting in unforeseen and overlooked consequences. This lady is a dementia patient with swollen feet, she presented with a dorsal proximal interphalangeal (PIPJ) joint ulceration, which is commonly due to deformity of the toe (O’neal 2008), and improperly fitting shoes and slippers (Frykberg et al 2006). I discussed this with the daughter which resulted in appropriate footwear being recommended. An added complication in this case was that the patient never stopped using abusive behaviour and obscene language. Her daughter felt very upset and embarrassed with the words that her mother used, she highlighted that her mother used to be the gentlest woman, never speaking like that. It is not easy working with patients exhibiting this behaviour, even though we know it is caused by the disease. Sometimes there is a need to be ‘thick skinned’ and not take things personally. The patient’s ulcer continued to be treated after this project finished. Dorsal proximal interphalangeal (PIPJ) joint ulceration. Onychauxis toenail with inflamed sulcus. This female patient with advanced dementia had been recently transferred to the ward from the Royal Edinburgh Hospital. In her records, she had aggressive behaviour recorded. When nursing staff cut her nails discharge was released, therefore they asked me to have a look. We thought that this might be the reason for her irritation and aggression. It took three nursing staff to help her with personal care. When I examined her, both 1st toe nails exhibited onychauxis, and the right 1st toe sulcus was inflamed, no exude and debris under the toenail. The nursing staff stayed with me as I was apprehensive to treat this lady in isolation. I sat sideways to avoid any sudden kicks or punches. During the treatment, the nursing staff talked to her to try and placate and distract her as much as possible. Unexpectedly, the entire process went smoothly. The lady was very calm, and then she hugged us. After the treatment, I could finally relax and I checked her again one week later. She did not show any challenging behaviour towards me, but even so, I was still very cautious as dementia patients cannot process information properly (Alzheimer’s Society 2018). They might not fully understand the explanation we give, or they are in their own thoughts and do not connect the words we use with their foot condition. Even if the patient has difficulty in processing information, it is still important to explain to them what we are doing, in simple, plain language. It is also better to provide treatment in a quiet environment as I have found this really helps. Unfortunately, I cannot prove that this lady’s foot problem was related to her behaviour because she did not change her behaviour following treatment. As in most elderly people, dementia patients suffer from onychomycosis and onychauxis. I also found onychogryphosis in some patients; this might be related to a delay in treatment following admission to hospital for other medical conditions which took priority. I have outlined four specific challenges and made recommendations for the foot care of dementia patients. Firstly: gait and falls. As studies show, walking as an exercise can have a positive impact on the dementia mind (Alzheimer Scotland 2009). However, falls are common amongst the elderly aged 65 and over (Age UK 2013). In the UK, after a fall an elderly individual faces a 50 percent chance of enduring impaired mobility (Age UK 2013, p4), and 70,000 patients are admitted for hip fracture operations and treatment per annum (Age UK 2013). How to prevent falls is one of the key issues that has been raised in caring for the elderly (CDC 2017). Cognitive impairment such as dementia has been found to be one of the reasons for such falls (Tinetti et al. 1988 and Chu et al. 2005). How can we prevent falls? As I mentioned in the case studies, I needed to understand the dementia patient’s gait. Dementia patients’ tendency to walk about has in the past been described as ‘wandering’ (Alzheimer Scotland 2009), which presents itself as restlessness, just aimlessly walking around. Patients can walk for miles without having a rest. They benefit from the exercise but put themselves at risk of falling and of causing harm to the feet. I learned that there are several factors affecting dementia patients’ walking. Firstly, side-effects of antipsychotic drugs, such as haloperidol, can affect walking and posture, which can cause extrapyramidal symptoms, increasing the risk of falls, shuffling and restlessness. Secondly, the misperception of flooring also affects the dementia patient’s gait. The research studies show that patients’ vision and perception can be affected (Alzheimer’s society 2016). I observed the patient(s) reluctantly walking, or stepping across something that was not there, like crossing an imaginary barrier whilst being on the flat floor. Considering all these factors, I found it difficult to give a proper assessment. All I could do was advise about appropriate shoes. However, instead of directly talking to patients, as I would do with patients without cognitive impairment, it was necessary for me to pass this information to the nursing staff, and with cases 3 and 5 to convince the patient’s family. This can be difficult as not many opportunities present themselves for the podiatrist to have such face to face conversations with family members. Secondly: verbal communication. This becomes progressively difficult, accompanied by memory loss, as their condition worsens. Regarding repetitive questioning, a study has suggested it is better to allow the person to express themselves than to challenge them (Alzheimer’s association 2018). Further, many patients develop restlessness and aggression which can be both physical and verbal. It is not easy to cope with patients using obscene or abusive words, like the lady in case 5, especially in a one to one situation. It is necessary to try to keep calm without feeling offended. Gradually you develop a ‘thick skin’ to enable you to deal with these situations. Dementia patients have been described as if they are in a time warp. They have memories of the past, sometimes going as far back as their childhood. I learned a lot from the dementia volunteer club by watching them sing songs from when they were young. Remember that the dementia patient is still an individual. Try to get to know their past which will help with communication. Always speak calmly, use their name, and any questions should be kept as simple as possible. Always give clear instructions, in the early stages of dementia, patients can find the words they want to use. However, in later stages, they might lose the ability to communicate completely. Thirdly: challenging behaviour. With the progress of dementia, many sufferers develop behaviours that can be challenging, like the woman in case 6. When the patient is examined and treated, they cannot process or understand what is happening or being said to them. Dementia patients can react as though the discomfort or pain is caused deliberately. Aggression can present itself physically and their behaviour can be unpredictable and difficult to manage. I did experience some fear myself in at least one of the examinations, even though this is an environment I am trained for and familiar with. 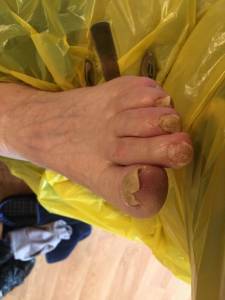 As a podiatrist dealing with any person who is distressed, you must watch for warning signs. When they are becoming more anxious or agitated, avoid making the situation worse, so try to distract them (NHS Learnpro 2018). During the project, I always had a box of chocolates, in other words I bribed them or calmed them with something they were familiar with. Fourth: footwear. Throughout this project, I found that having the correct footwear is essential for these patients. Poorly fitting footwear has been recognised as an extrinsic factor for causing falls (Spink et al, 2011). In some of the cases I documented, this had not been understood or given a high priority. As previously discussed, convincing the patient’s family is not always an easy task, and it may be necessary to take time to understand and get to know the family before deciding how best to advise them. For example, what has the family been through in caring for the patient? What feelings are they themselves suffering from? I also encountered people such as relatives who assumed that the patient did not walk as much as before, concluding that therefore, footwear is not as important. The patients themselves are not able to understand the implications of their own choice of footwear. I watched one lady choose her footwear. She chose her smart black shoes with high heels that she used to wear all the time, instead of the more appropriate comfortable shoes. NHS Lothian podiatry basic footcare education programme available on their internet sites. This includes providing practical demonstrations on nail cutting/filing (on request). Written and visual education materials including a learnpro module entitled basic footcare. Treating dementia patients presents very specific issues in terms of communication, patient management and in some cases handling. The patients suffer from foot issues common to the elderly population, but their inability to communicate regarding their foot pain can cause aggressive and misleading behaviour. i.e. what looks like a symptom of dementia could be a reaction to a foot issue. In some cases, the behaviour of the patient can actually put further pressure on the foot, such as wandering whilst not wearing appropriate footwear etc. It is essential that nursing staff are fully supported because they are the first line of defence in identifying issues. Patients’ families should be made aware of how important foot care is for the patient and how lack of care can exacerbate issues. This is something nursing staff can help with. I would like to acknowledge the support I have been given throughout this project from both NHS Lothian podiatry department and nursing staff in Willow ward in Ferryfield House. AGE UK, 2013. Falls Prevention Exercise-following the evidence. Available from: https://www.ageuk.org.uk/globalassets/age-uk/documents/reports-and-publications/reports-and-briefings/health–wellbeing/rb_2013_falls_prevention_guide.pdf. BROWN, D. (2007). Draining Subungual Hematomas. in Essential clinical procedures (second edition). NHS Learnpro., 2018. Supporting people with dementia in acute care. SPINK, M.J., MENZ, H.B., FOTOOHABADI, M.R., WEE, E., LANDORF, K.B., HILL, K.D., LORD, S.R., 2011. Effectiveness of a multifaceted podiatry intervention to prevent falls in community dwelling older people with disabling foot pain. British Medical Journal. O’NEAL. L.W., 2008. Surgical pathology of the foot and clinicopathologic correlations. In Levin and O’Neal’s The Diabetic Foot (Seventh Edition).